An assortment of colors for your crafting needs. Includes green, light green, pink, yellow, clear, orange, red, brown, purple, light blue, black and white. 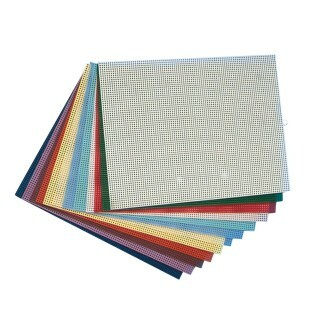 Sheets are #7 mesh (7 holes per inch). Size: 10-1/2” x 13-1/2”. We would cut the sheets in half so they would go further. The sheets are too large for younger children to finish anyway. Not only do we use the canvas sheets for various needle-work projects such as coasters bookmarks signs etc but we use the small pieces to place over the hole on the bottom of flower pots so that the water drains out but the dirt stays in which helps to prevent a mess.